This is an anonymity device that separates an idea from its creator. Ideas hold unlimited potential, but they are rarely judged on their own merit. The perception of ideas is often tainted by the identity of their author; their message clouded by bias. 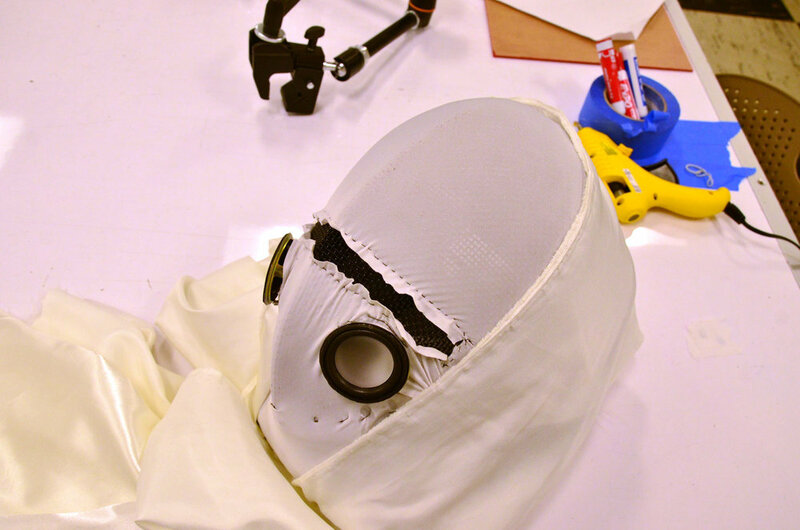 This mask conceals the user's voice and appearance. The user speaks into a small microphone, and their voice is distorted and projected through two speakers embedded into the front of the mask. The basic frame of the mask is a fencing helmet. The helmet contains a NeoPixel LED strip, a former webcam microphone, two portable speakers mounted to the front of the helmet, and light-diffusing fabric. When the user speaks, their voice is recorded and the analog input is shifted in pitch by a semi-random amount derived from the volume of their voice. This distorts their voice in real-time, allowing the user to interact with an audience while remaining anonymous.